Claremont House is a large detached period property set in grounds of an acre. Gardens for you to sit a while and enjoy the breath taking views. Lock up Cycle and bike storage available. Drying facilities for those wet days. Fantastic walks from outside the gates. Maps available. A Just on the outskirts of towna ten minute walk down Manor Brow Road takes you into the market square of Keswick. in your room on arrival. Delicious hearty breakfasts, locally sourced produce, Special diets catered for. Free WIFI access available throughout the house. kettle and choice of hot drinks and biscuits. Children aged 8 years and over very welcome. Sorry pets not catered for. A great personal service to make your stay memorable. Garden Room.Ground floor Super king or Twin bedded. Complete refurbishment. Large ground floor Super king orTwin bedded room. With beautiful en-suite facilities. Seating area to relax in and take in the view of the garden. Red squirrels visit on a regular basis. Limited Mobility Access - The ground floor room is suitable for people with limited mobility as there are no stairs. However please note that there are not suitable bathroom facilities for wheelchairs. This room is suited to guests with limited mobility. of Keswick, Bassenthwaite, Derwentwater and the surrounding fells. Large luxury shower en suite facilities. Seating area that takes in the beautiful views of the fells and Keswick. Complete refurbishment. 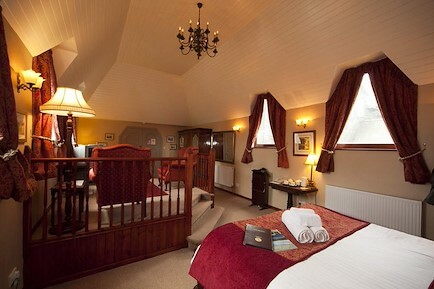 King bedded room with views of Catbells and the surrounding fells. Full private shower en-suite facilities. 2 comfortable easy chairs to relax in. large windows that take in all the views that the fells have to offer. Large luxury shower en-suite facilities. This room can also accomodate a family 2 adults and up to 2 children. Or become a flexi room for 3 friends. Please ring for great deals. Complete refurbishment. King bedded room Full en suite shower facilities. 2 comfy tub chairs Overloking the garden. Red squirells frequent visitors to the feeders. Complete refurbishment. King bedded room. Full shower en-suite facilities. 2 comfortable easy chairs to relax in. Views which overlook Keswick and the fells. Leave the M6 motorway at junction 40 (Penrith) and head West towards Keswick on the A66. After approximately 16 miles take the first turn in to Keswick and keep left joining the main road into Keswick. Go past the town sign and at the T-junction turn left up Chestnut hill (signposted A591 Windermere). Claremont House is 300 yards on your left. If you decide to head through the South Lakes on the A591, head North towards Keswick. When you drop down Chestnut Hill and past the town sign, Claremont House is approximately 300 yards on your right. Your enquiry will be sent directly to Claremont House. Please fill in as much detail as you can.